A pre-concert talk and string quartet interview in Den Haag inspired Anne Ku to follow suit in Phoenix and San Francisco in her duo concerts. At the opening night of the International Chamber Music Festival in the Hague in September 2010, I witnessed a format I liked very much. The founder and artistic director, Eva Stegeman, inspired by TED talks, invited conductor Itay Talgam to give a pre-concert talk. Talgam went on to interview Dutch violinist Stegeman and her quartet, interrupting them after the first 10 minutes of Beethoven’s Quartet in F Major (opus 59 no. 1). If you don’t have a conductor, how do you know when to begin or end? Who leads? Which passage do you like best? How do you indicate the right tempo? These are questions we don’t ask ourselves when we are rehearsing. How musicians communicate with each other in rehearsals is a mystery to most non-musicians. As performers, we don’t dissect the way we get our messages across. We indicate. We interpret. We might discuss. We compromise. It is not a science. We simply take it for granted, as musicians. I had intended to write a review of that pre-concert talk and opening concert of the string quartet, but I got swept away by the momentum of preparing for our concert tour of the USA. Talgam and Stegeman’s on-stage “quartet discussion panel” brewed on my back burner until I got a chance to re-enact it in Phoenix, Arizona in early November and again in San Francisco. 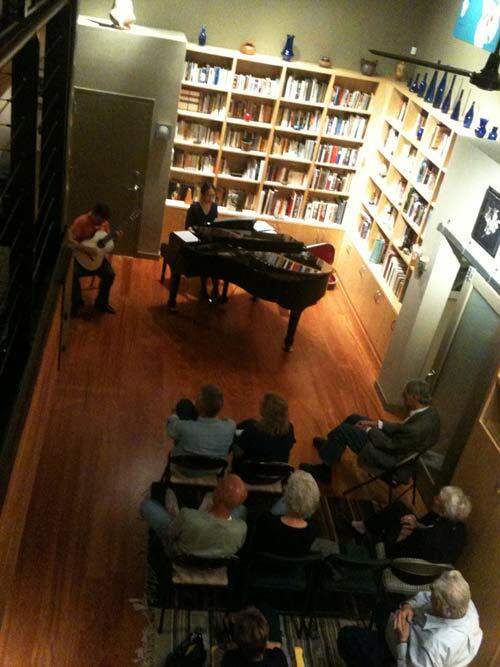 At the Spirit of the Senses event in a loft apartment in Phoenix, Arizona, we gave a duo performance before the intermission. Afterwards, I invited Tom Houlon, the organiser, and guitarists Robert Bekkers and Matt Gould to sit in front of the audience. I moderated a discussion panel on house concerts. Two weeks later, something similar happened in another loft apartment. After a chef-catered gourmet dinner, I invited the concert host Dr Chong Kee Tan to talk about his activities as amateur pianist, founder of his piano club, and founder/developer of High Note Live, an online software to manage artists, concerts, and audiences. I contrasted this against the view of the next panellist — composer, software-developer, and artistic manager Marc Parella. Only after the discussion panel did Robert Bekkers and I give our duo concert. Because of the energy economists in the audience in San Francisco, I deliberately referred to cultural economics. While energy is a commodity, music is anything but. The half-hour discussion allowed the audience to participate. Perhaps this is a possible formula for future house concerts. Your blog is becoming more and more meaningful to me, since you are so interestingly exploring by doing and thinking how live music (what we use to call: concerts) and economics go together. It has been tried many times to combine music with any other activity: theatre, light shows, reading poems, dancing, showing pictures or photo’s, etc. etc. In some peculiar way music, just listening to music being played live is “not enough”, for so many people. Now I think you added a very interesting variation, since playing music is still just about the music, and you combine in the program with a discussion on playing music. 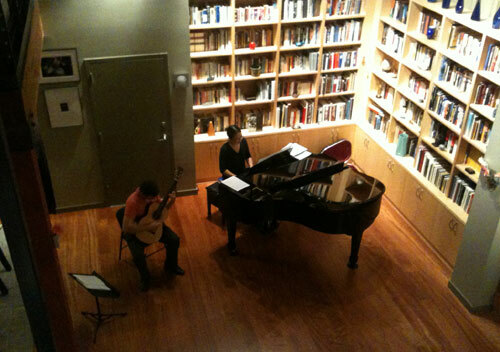 Having the musician(s) talk about their work – I witnessed that before – has a large appeal on the audience. Especially when the talking is not fully prepared (as in a presentation on e.g. the piece and the composer, given before playing). This kind of “thrill” adds to the experience, and may enhance the experience of listening, which in my opinion is the best what a concert player can possibly achieve. Good luck with your further explorations. Thank you, Ton! Thanks also for following my blog. I am finally finding the time to read and write, at the expense of a short holiday from my piano. The audience in America is used to talk shows and radio shows that invite them to ask questions and have a say. I would love to find out if the culture in the Netherlands and elsewhere in the world is also so receptive. Although I enjoyed the “Chamber Music X’rayed” in the Hague immensely, some people might have preferred that the string quartet played the entire Beethoven piece first and then talked about it afterwards. If the concert and discussion format is a promising one, perhaps it’s worth exploring which comes first: the concert or the discussion. What a beautiful place and beautiful idea to not only share the music but the stories behind creating and performing it, as you did here in Denver! We would love to add more of this interactive component to our house concerts and intimate salon-type appearances when we tour in 2011. Anne, your blog is so helpful to fellow artists and arts patrons (or those soon to be!) alike. Kudos!